Some friendly neighborly advice. BEFORE you take off in your boat, make sure you have all the required items, boat registration, stickers are up to date, lights are working if out after dark. We have great DNR and sheriff patrol personnel, but you will find they will do safety stops to assure you have everything. It can get quite pricey if you don’t have the required items. Below are areas you need to know. In South Carolina, vessels may not be operated in excess of idle speed within 50 feet of an anchored vessel, wharf, pier, dock, or a person in the water. All boats must have a US Coast Guard approved wearable type PFD for each person on board or being towed. Each PFD must be in good condition, readily available and the proper size for the intended wearer. In addition, boats 16 feet in length or longer must carry a Type IV throwable device. In South Carolina, any person under twelve years of age must wear a US Coast Guard approved Type I, II, III, or V PFD when on board a class “A” (less than 16 ft. long) boat. Navigation Lights must be on between official sunset and sunrise. All boats less than 39.4 feet must carry an efficient sound producing device. In South Carolina, boat operators under age 16 must complete a boating course approved by the SCDNR to operate a boat or personal watercraft with a 15 h.p. motor or greater, unless accompanied by an adult age 18 years or older. The seller of a used watercraft or outboard motor in South Carolina must produce a South Carolina Certificate of Title in his/her name at the time of sale. Titles are valid until the watercraft or outboard motor is sold, traded or exchanged. A title with erasures, white out or information marked through is not valid. The owner must request a duplicate title. Titles are required for all sailboats, all outboard motors 5 horsepower and greater, and all other watercraft except: documented vessels, windsurfers, and those propelled by human power with oars, paddles or similar devices. Watercraft propelled by any mechanized means must be registered in addition to being titled in the owner’s name. The 2018-2019 Boating Information is provided in the Adobe® Acrobat® (PDF) format. Download here. In South Carolina, each person on a personal watercraft must wear a US Coast Guard-approved Type I, II, III or V PFD. A personal watercraft may not be operated between sunset and sunrise and must be equipped with a self-circling or lanyard-type engine cutoff switch. When operating a personal watercraft, one may not operate in a manner so as to leave the water completely while crossing (jumping) the wake of another vessel within 200 feet of the vessel creating the wake. Find the lake resources and information you need to help us all build a better community. ConnectLakeGreenwood.org is the best place for information about Lake Greenwood in South Carolina. We are a group of volunteers, businesses and residents who want to make life on the lake better for everyone. 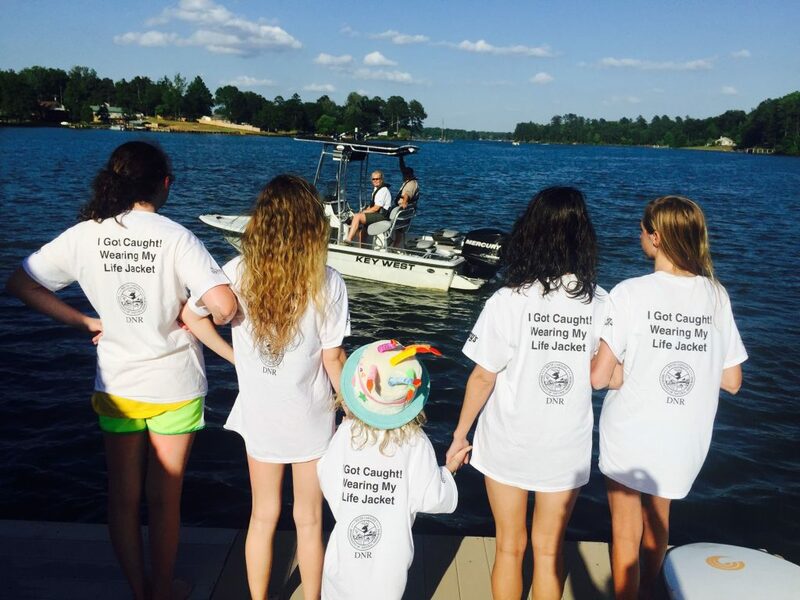 Consider joining to help support and improve life on Lake Greenwood!